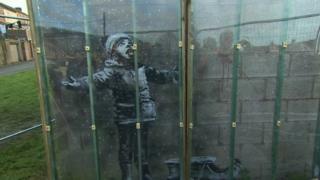 Banksy’s latest work in south Wales has been covered with a protective plastic screen. 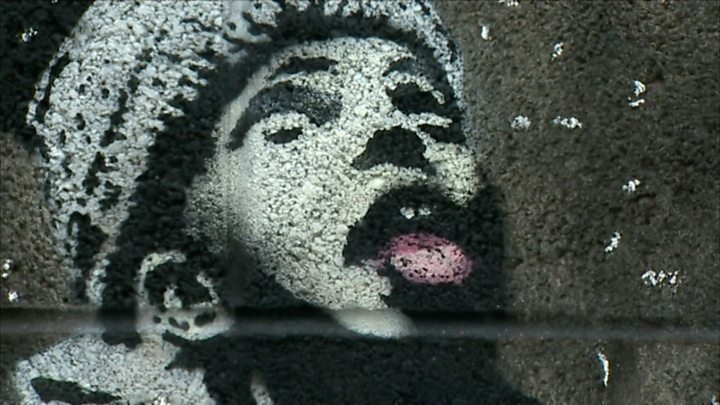 It appeared on a garage in Port Talbot and depicts a child enjoying snow falling on one side, while the other reveals it is a fire emitting ash. Film star Michael Sheen, who grew up in the area, helped pay for the screen. He is also contributing towards security, media and legal costs. It was fitted for free by a local businessman earlier. Volunteers protecting the elusive artist’s latest mural – called “Season’s Greetings” and reflecting the town’s industrial heritage – say at least 2,000 visitors have turned up to see it. It appeared on Ian Lewis’ garage on a lane behind Caradog Street in Taibach on Tuesday. Traffic wardens have been drafted in by the local council to control traffic. Sheen, who is from nearby Baglan and best known for roles in Frost/Nixon and The Damned United, wants to ensure the financial burden of safeguarding the art does not fall on Mr Lewis, his office has said. Banksy confirmed the image was his when he posted a video on his Instagram account on Wednesday.